Be it dry skin or oily, every skin types needs to be moisturised to maintain its natural balance and keep it soft. When I did not know much about skin care, I always neglected a body lotion because I thought I had oily skin and didn’t need it. The truth is if you provide your skin with enough oils and moisturization, it will not produce any excess and will stay balanced and calm. Moisturisng the skin every day by using a lotion can prevent oiliness that can ultimately prevent acne. There are thousands of products in the market today meant for various skin types and issues, it is just a matter of your knowledge and choice whether you buy the best product for your skin. Do not skip a body lotion/moisturiser but make sure you buy a water based product having a light texture and non greasy formula. 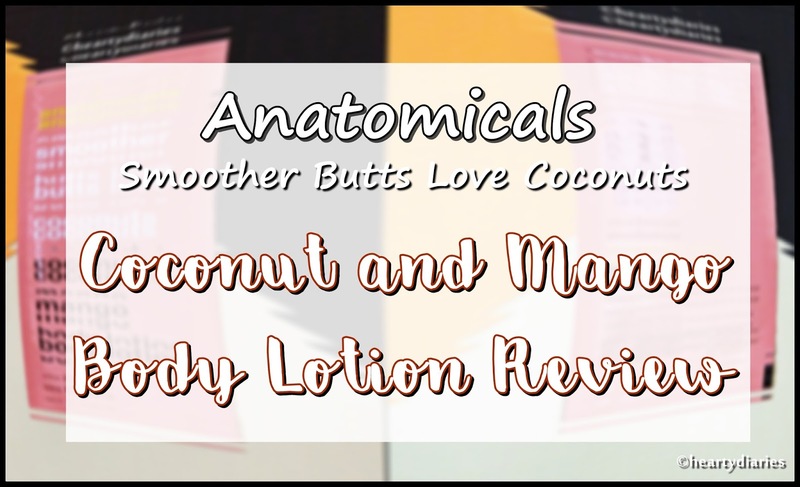 Today I am sharing my review about Coconut and Mango body lotion from Anatomicals via its sample sized sachet worth Rs. 65 for 10 ml product which I received in my July 2017 My Envy Box. I was supposed to share my reviews about July’s Envy Box at the starting of this month but it got delayed unfortunately. 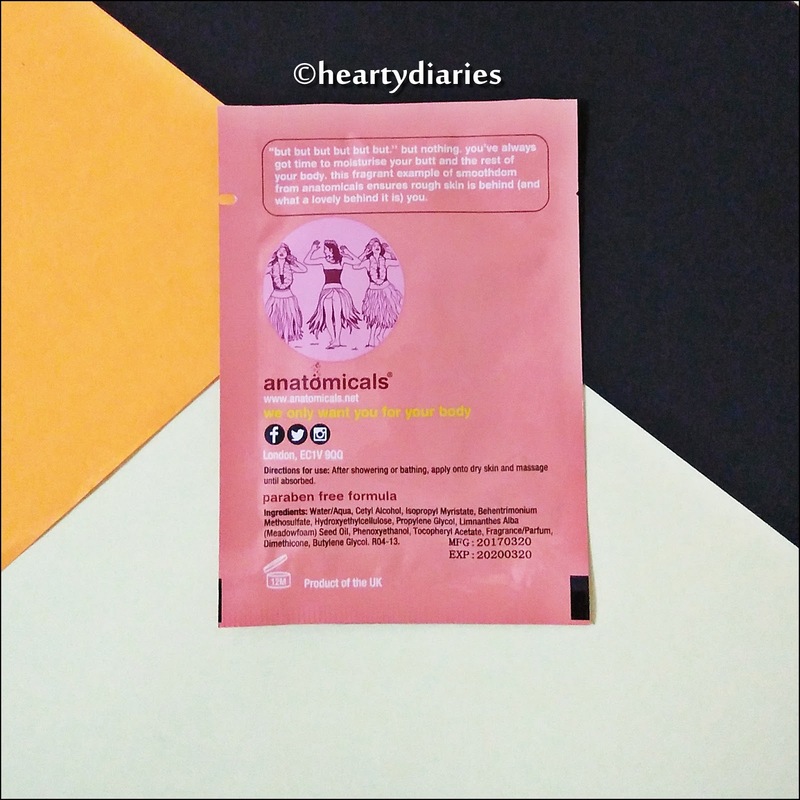 Please keep on reading this post till the end to know my overall experience, opinion and final verdict about this product so that it helps you form an opinion whether you want to spend your hard earned or saved money on it or not.. But before that, please take a minute out of your valuable life to write a “testimonial” or “comment” for me using your Facebook account here as I really need it to win The Indian Blogger Awards 2017.. Directions of Usage: After showering or bathing, apply on to dry skin and massage until absorbed. Shelf Life: 36 months, if unopened; 12 months, if opened. Packaging: As I mentioned earlier, I am reviewing this product via a sample sized sachet. The sachet is quite identical to the actual packaging of the product which is basically a rubber tube. As seen in various pictures, I can say that the product comes in a peach colored tube and has a plastic, semi-transparent, yellow flip cap. The front of the sample as well as full sized product just has the product name and quantity mentioned. At the back of both, there is a little description, a picture, directions, ingredients along with brand’s details mentioned. Smell: Mild and pleasant smell of Coconut and Mango; Mango’s scent being on a much stronger side, not overpowering though. Texture and Consistency: This body lotion has a light yellow color; very light, non greasy texture and a creamy consistency more on a thicker side. 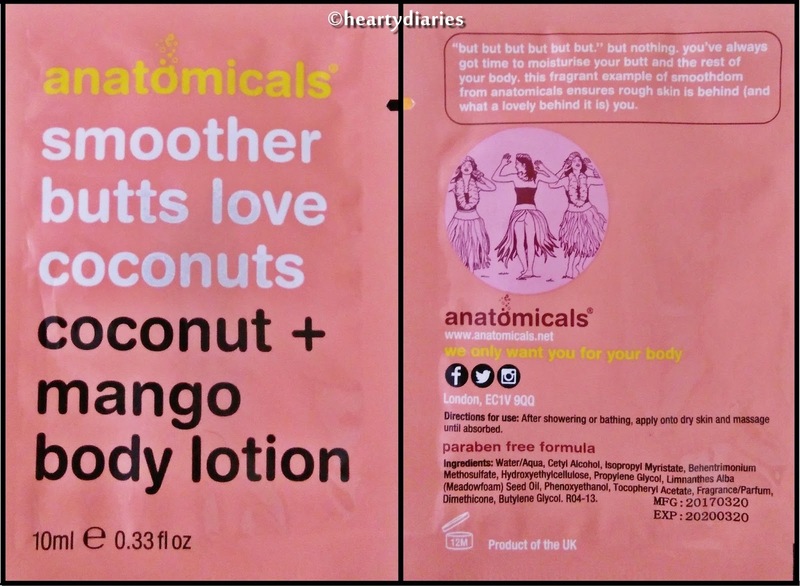 My Experience: I had never heard a combination of coconut and mango before and couldn’t wait to use this product to see what it feels like. This cream had a nice impression on me in the first go in terms of the smell, texture and consistency. The best thing I find in it is that it is free from DEAs, sulphates, parabens and SLSs. I gently massage it on my face in a circular motion. SInce it is very light, it gets absorbed pretty quickly and doesn’t feel heavy at all. I love the non greasy formula which is a plus point for people having excessively oil skin. The fragrance is something I like but wouldn’t like to linger on me through out the day or else I will get really bored out of it. Thank God it stays for hardy 30 minutes and then there is a very very light smell the entire day. This lotion makes my face really soft and smooth instantly, so I found it as an amazing after shave cream to make my skin feel super soft and silky. I am a very sweaty person and cannot tolerate creams that makes my hands greasy and slippery but this lotion passes this test as well and can serve as a really good hand cream. A little amount of product is required to make my skin soft and hydrated. The effects lasts all day long which is another plus point. Now the only issue I feel is that it has not given me a very new experience. The overall result, the moisturisation and nourishment is great but there is nothing that impresses me extremely much. It is not the only body lotion out there that has a nice fragrance, makes the skin soft and the effects last all day long. No. I’ll rather save my precious money and buy some other stuff in such amount as I do not find any wow-factor in this product. It is just a normal body lotion and has nothing so great worth repurchasing. Yes, if you are on a high budget and hunting for a paraben free body lotion, go for it. BUT if you are not, go buy Vasaline. Not exactly. As I said, the result is not bad but it has no such different level of moisturisation which makes it worth the money charged. The quantity offered is really less as per the price point, so I’ll not say that it is worth. Final Verdict: Overall this lotion is a good one and did not harm my sensitive skin at all. However, I feel that the result is not extremely different from other body lotions you get in the market for a much lower price. It is expensive to be used on a daily basis but since it is paraben free, it makes the product one step higher for skincare enthusiasts out there. Anatomicals definitely has some interesting fragrances. This one sounds decent. Yes… The frgarance is nixe…. Thanks for stopping by!! ? Thanks for your honest review. I would rather skip it. Really pricey! Thank you so much… Yeah, i would love to… ?